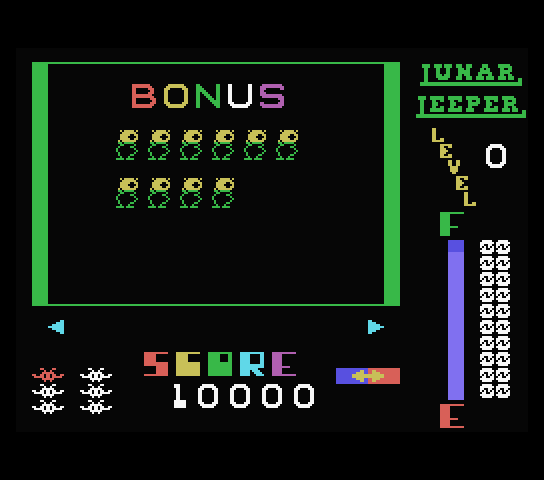 I'm doing the Colecovision version of Lunar Leeper, a game announced by Sierra Online and only published for C64, Atari 8-bit and Apple ][. So far I've solved all the technical hurdles of it, mainly the scrolling engine and fitting all the required graphics for it. Also I've drawn all the required graphics. Apr/01/2019 lunar valley visuals working. Last night I was testing games with my CoolCV emulator in search of things that aren't emulated properly, I had a set of backup CD with ROMs from old times (probably made in 2005). One of these CD turned up to be interesting because it was a FTP directory that I downloaded in year 2000, it was simply named COLECO. I remember I downloaded many ROM files from FTP but didn't took note of site names. It was a pretty complete recopilation of the Colecovision games, but one game that brought my attention was LUNAR.ROM dated Nov/04/1996, probably dumped by someone. Interestingly I had tested all games before but this one didn't caught my attention because it was incomplete and I forget altogether about it, but this time (and after years of experience collecting Colecovision games) I recognized a prototype game!!! Lunar Leeper by Sierra Online. Do you recall the ftp server from which this file came? Just curious. Edited by mumbai, Mon Apr 1, 2019 10:03 AM. I've been pranked! May this day pass quickly. Edited by alekmaul, Mon Apr 1, 2019 11:01 AM. So for now my personal prank mark is 32 minutes before discovery. As soon as I saw Lunar Leeper, I knew it was an April Fools prank considering that was my guess for the CollectorVision proto that is yet to be revealed. I think I found interesting the game so I had to do something. It will be interesting to see how you pull off the scrolling cavern sequence of the game. What a fun project! I always likes this game on the C64! The Lunar Valley level is now fully playable. Lunar Leeper for Colecovision now finished and bug fixed, 7680 lines of Z80 assembler source code, 32K ROM and many graphics for the scrolling levels. Fantastic - another vaporware game soon to become available. Great work. Enough with the April Fools joke already! Wait, you're telling me that when I was playing Learning With Leeper, I was actually playing as the bad guy??? Very smooth scrolling. Even the scrolling text on the bottom of the title screen is smooth scrolling. Very cool!!! Edited by Kiwi, Yesterday, 3:57 AM.